As we planned the construction of the new church in our parish, the people asked if we might have a shrine to the Divine Mercy. In the shrine, we had the idea to honor the first-class relics of Pope St John Paul II and Saint Faustina—the simple nun to whom the devotion to the Divine Mercy was given. On inquiry, we discovered that to receive a first-class relic of Saint Faustina we would have to travel in person to Krakow. It was the perfect opportunity to make a parish pilgrimage to Poland. It emerged that we could collect a relic of John Paul at the same time. So on a memorable day in May 2015, at the conclusion of a fifteen-day trip, we went to the Archbishop’s Palace in Krakow and met Cardinal Stanislaw Dziwisz—the long-serving friend and secretary of Pope John Paul II. After receiving the relic from him, we spent time in his private chapel—the chapel where the young Karol Wojtyla was secretly ordained in the midst of the Nazi occupation of his country. A new book about John Paul brought back the memory of our blessed pilgrimage. 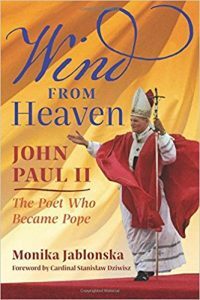 As George Weigel has written, “The sheer drama of Karol Wojtyla’s life would defy the imagination of the most fanciful screenwriter.” Monika Jablonska’s Wind from Heaven-John Paul II—The Poet Who Became Pope approaches the great man’s life from the viewpoint of his being first and foremost a man of letters. Ms. Jablonska first recounts the great events of John Paul’s papacy— the stunning election of the first non-Italian after the dramatically short reign of John Paul I, the assassination attempt, his friendship with Ronald Reagan, his tightrope walk in the face of the power of the communist regime, his confrontation with liberation theology, and his sheer energy and enthusiasm. She then discusses John Paul’s reliance from the beginning on poetry and drama. He was not only an actor, a poet, and a playwright, but he saw literature and culture as driving forces of redemption in the world. Wind from Heaven reminds us of the power of literature to renew the imagination, purify the language of the tribe and inspire the noble pursuit of truth, beauty, and goodness. It has often been remarked that Pope John Paul used his talent as an actor in his preaching, his dramatic gesture, and his sense of timing. Ms. Jablonska shows that his appreciation of poetry and drama held within it an even deeper gift. This gift was the realization that poetry and drama are the expressions of a human longing and a more profound sense of human aspiration than simple religious devotion or the technique of theatricality. 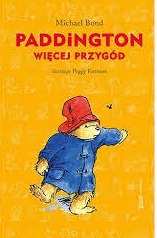 This sense of drama and poetry meant that there was purpose and meaning to the world, and it can be argued that everything else in John Paul’s mission, philosophy, catechesis, and spirituality flowed from this essential appreciation of literature and culture. He was devoted to the truth of the Christian gospel, and it was in Christian culture—particularly in the history and the Christian culture of his beloved Poland that he saw the truths of the Christian faith incarnated most poignantly and triumphantly.